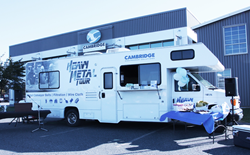 The new members of Cambridge Engineered Solutions Outside Sales Force will go on a "Heavy Metal Tour" visiting 50 customers in 20 states in the company's Heavy Metal RV. Cambridge Engineered Solutions, the world’s largest manufacturer of metal conveyor belts, has tripled the size of its outside sales force by hiring six technical managers and promoting two company veterans who will work in select regional and industry markets throughout the United States. The belt manufacturer has also added an inside sales manager at its Maryland headquarters. The new outside sales team members will hit the road June 6 and embark on a three-month, 20-state road trip in Cambridge’s signature “Heavy Metal” RV to visit to dozens of distributors, food processors and industry equipment manufacturers. Hired in the first quarter, the new sales managers add tremendous subject expertise and experience to the Cambridge outside sales force that has expanded to 10 employees, according to Tyler. The new technical sales managers are: Joseph DuBord, High Temp/U.S. and Canada; Matt Farrar, Bakery/West of the Mississippi; Sam Jodka, Food and Dairy/East; Jim Law, Bakery/East; Darren McCune, Protein/South East; Ty Spainhour, Protein/South Central. Charlie Hennigar has been promoted to outside sales and will focus on OEMs and Cambridge veteran Eva Winther will concentrate on the filtration market in the U.S. and Canada. Based at Cambridge headquarters, Chris has a background in B2B sales. He was raised on Maryland’s Eastern Shore and graduated from Salisbury University with a business degree. He joined Cambridge in March and looks forward to sharpening his knowledge and putting it to use for the food processing industry. A lifetime resident of St. Paul, Minnesota, Joe was hired in March as a high-temperature manufacturing specialist. For almost two decades, he’s worked in wholesale distribution sales in the market. Joe looks forward to bringing his considerable experience in metallurgy to Cambridge. Matt brings extensive outside sales and management to Cambridge. He joined the team in March and is focused on helping baking companies in the western region recognize the health, safety and cost benefits of metal belts. Matt lives in Fort Smith, Arkansas and graduated from the University of Central Arkansas. After 10 years in the metal industry, Sam was drawn to Cambridge’s reputation for outstanding customer service and round-the-clock technical support. A 2001 graduate of Wittenberg University with a BA in Economics and East Asian Studies, he will represent food processing and dairy markets. New Jersey resident and manager Jim Law brings a background in manufacturing partnerships, IT and document technology to his role as Cambridge’s new manager for Baking/East. Law studied business administration and international business at Stockton College. With 15 years in outside sales across multiple industries, Darren joined Cambridge in April and is focused on nurturing existing partnerships and cultivating new customers in the protein market. A resident of Suwanee, Georgia, he earned his B.B.A. and M.S. from Georgia State University. Arkansas-based Ty Spainhour joined Cambridge in January following a decade at Precision Metal Works. A former Special Forces Engineer for the U.S. Army, the experienced veteran was attracted to Cambridge’s comprehensive and consolidated custom solutions approach to simplify the end user’s experience. A division of Cambridge International, Cambridge is the world's largest metal conveyor belt manufacturer and a global leader in filtration screens. For more than a century, Cambridge has developed dynamic solutions, revolutionizing industry automation and plant operations. With more than 15 exclusive product lines and over 50 patents, our team of dedicated engineers and experts continually devise new methods to make lines run smoother, faster and handle more product weight. For information visit http://www.cambridge-es.com.